The original inhabitants were the Luiseño people, who are in the Shoshonean linguistic group. One of their rancherias (villages) was Palamai, which was located near present downtown Carlsbad. Today, the Luiseño live on one of several Indian Reservations inland near Palomar Mountain. Much of greater Carlsbad was part of Rancho Agua Hedionda (which means "Stinking Water"). This 13,311 acre ranch was granted to Don Juan María Marrón in 1842. Some of the original ranchhouses are now incorporated in modern buildings. Carlsbad started as a whistle stop on the new California Southern Railroad. In the 1880s John Frazier, another former ship's captain, dug a fresh-water well that came to be used for thirsty locomotives. The stop became known as Frazier's Station. Frazier dug another well that produced mineral water. The water was analyzed and found equal in mineral content to one of Europe's most popular health spas--Karlsbad, Bohemia (now Karlovy Vary, Czech Republic). (Karlsbad bath salts, badesalz, available here). Later, Carlsbad was renamed "Carl" for a time because of confusion with Carlsbad, New Mexico on train schedules and because of hysteria during World War I. Popular demand restored the former name. Carlsbad is an old village dating from the 1880s. The Carlsbad Historical Society produced a self-guiding walking tour map available at the Visitor's Center in the Old Santa Fe Train Depot (below). Frazier's Mineral Well, site of the original well dug in the 1880s. The discovery of mineral water lead to a small bottling works and the 100-room Mineral Springs Hotel. The well is in front of Alt Karlsbad Hanse House, a three-story, half-timbered turreted home. A memorabilia museum and art gallery are in the basement. 2802 Carlsbad Boulevard. Picture. Old Santa Fe Depot. The depot was built in 1907 (replacing the first built in 1887) by the Arizona Eastern Railway and also served as a telegraph office, Post Office, Well Fargo Express Office, and general store. Served in later years as a shipping point for local fruit, vegetables, and flowers. Closed in 1960, it is now the home of the Visitor's Information Center. 400 Carlsbad Village Dr. On the National Register of Historic Places. Picture. Twin Inns, built in 1887. This is the former mansion of Gerhard Schutte, a co-founder of Carlsbad. Built in Queen Anne architectural style. This distinctive building is now Neimans Restaurant, 2978 Carlsbad Blvd. Picture. Magee House, built in 1887. Home of Samuel Church Smith. On Carlsbad Blvd (old 101), and Beech Ave. Operated by the Carlsbad Historical Society. Picture. Carrillo Ranch--the Rancho de Los Quiotes, in La Costa, an historic ranch that has become an extraordinary, passive community park. Operated by the Friends of Carrillo Ranch, Inc. On the National Register of Historic Places. Picture. St. Michael's Episcopal Church, built in 1896, is a small white chapel. On NW corner of Christianson Wy. and Carlsbad Blvd. St. Patrick's Church (Heritage Hall), built in 1926. 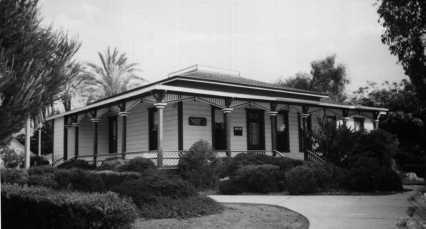 Served as Carlsbad's first City Hall when Carlsbad was incorporated in 1952. On corner of Cypress and Garfield St. next to Magee Park, off of Carlsbad Blvd. Old home and barn, Magee Park, Beech Ave. between Carlsbad Blvd. and Garfield St. The park is named for Florence Shipley Magee who willed it to the city. Friends of Carrillo Ranch, Inc. Both of these groups are very well known, active and effective. The Society conducts school tours of Magee Park each year in May. The Friends has an extensive out-reach program throughout the school year for California history students in the fourth grade, an educational service offered free of charge in the Carlsbad, Encinitas, Oceanside, San Marcos and Vista Districts. Rancho Buena Vista Adobe is at 651 E. Vista Way in neighboring Vista (c. 1850). This website is not authorized or sponsored by any government agency. The bear fetish is the 7000-year-old Official State Prehistoric Artifact from Carlsbad. Last updated 1 December 2013.